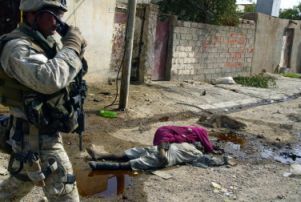 A Marine walks past several corpses strewn in a Fallujah street. [Source: Al Jazeera]The US military undertakes Operation Phantom Fury in an effort to retake the city of Fallujah from Sunni insurgents. During the more than two-week long offensive, Iraqi NGOs are prohibited from delivering humanitarian aid to residents of the besieged city. A representative for the Iraq Red Crescent Society (IRCS), Muhammad al-Nuri, will estimate that at least 6,000 Iraqis are killed in the offensive. The Iraqi government’s own studies will suggest that 70 percent of Fallujah’s buildings are destroyed by the fighting. [IRIN, 4/4/2004; Washington Post, 11/9/2004; IRIN, 11/26/2004] In the ensuing battle, the city’s water, power, and food supplies are completely cut, actions later condemned as violations of the Geneva Conventions by a UN special rapporteur, who accuses the US of “using hunger and deprivation of water as a weapon of war against the civilian population.” At least 200,000 civilians flee Fallujah, many ending up in squatters’ camps with no basic facilities. “My kids are hysterical with fear,” says one Iraqi father. “They are traumatized by the sound [of fighting] but there is nowhere to take them.” The US military bars the Red Cross, Red Crescent, and journalists from the area. All males between the ages of 15 and 55 are forced to stay in the city (see November 10, 2004). Over 100,000 civilians are trapped in the city during the US siege, forced to endure a pitched battle between US forces and between 600 and 6,000 insurgents. First-Hand Accounts - There are a number of first-hand accounts of the battle, as well as video footage and photographs, suggesting the use of white phosphorus against human targets.